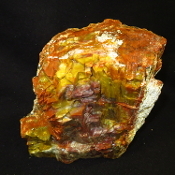 This small rough log of AZ Petrified Wood weighs 22.5 Lbs. It measures 9 x 7 1/4 x 5 1/2 inches. First photo shown wet. SHIPPING CHARGES WILL BE INCURRED. 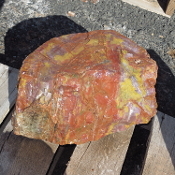 This small rough log of AZ Petrified Wood weighs just under 18 Lbs. It measures 7 5/8 x 6 x 6 inches. First photo shown wet.SHIPPING CHARGES WILL BE INCURRED. 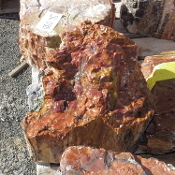 This AZ Petrified Wood small log weighs over 25 lbs. It stands 9 1/2 inches tall and measures 8 x 4 1/2 inches across. First photo shown wet. SHIPPING CHARGES WILL BE INCURRED. 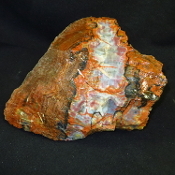 This AZ Petrified Wood small log weighs over 55 lbs. It stands 9 1/4 inches tall and measures 9 x 8 inches across. First photo shown wet. SHIPPING CHARGES WILL BE INCURRED. 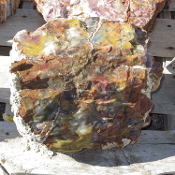 This AZ Petrified Wood small log weighs over 36 lbs. It stands 7inches tall and measures 12 1/2 x 12 inches across. First photo shown wet. SHIPPING CHARGES WILL BE INCURRED. 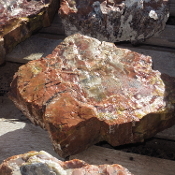 This AZ Petrified Wood small log weighs over 45 lbs. It stands 11 1/2 inches tall and measures 9 x 10 inches across. First photo shown wet. SHIPPING CHARGES WILL BE INCURRED. 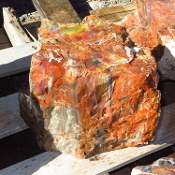 This AZ Petrified Wood small log weighs over 70 lbs. It stands 11 inches tall and measures 9 3/4 x 10 1/4 inches across. First photo shown wet. SHIPPING CHARGES WILL BE INCURRED. This AZ Petrified Wood small log weighs over 81 lbs. It stands 8 3/4 inches tall and measures 13 1/4 x 10 1/2 inches across. First photo shown wet. SHIPPING CHARGES WILL BE INCURRED. This AZ Petrified Wood small log weighs over 89 lbs. It stands 12 1/2 inches tall and measures 13 x 9 inches across. First photo shown wet. SHIPPING CHARGES WILL BE INCURRED. This AZ Petrified Wood small log weighs 132 lbs. It stands 13 1/2 inches tall and measures 18 x 12 inches across. First photo shown wet. PLEASE EMAIL FOR SHIPPING CHARGES. This AZ Petrified Wood small log weighs 137 lbs. It stands 11 inches tall and measures 16 x 10 1/2 inches across. First photo shown wet. PLEASE EMAIL FOR SHIPPING CHARGES. 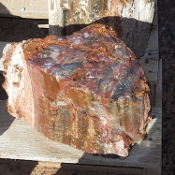 This AZ Petrified Wood small log weighs 42 lbs. It stands 6 1/2 inches tall and measures 12 x 8 inches across. First photo shown wet. SHIPPING CHARGES WILL BE INCURRED. 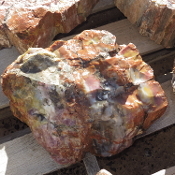 This AZ Petrified Wood small log weighs 75 lbs. It stands 11 inches tall and measures 16 x 10 inches across. First photo shown wet. SHIPPING CHARGES WILL BE INCURRED. 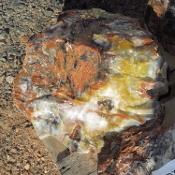 This AZ Petrified Wood small log weighs 45 lbs. It stands 11 inches tall and measures 12 x 7 inches across. First photo shown wet. SHIPPING CHARGES WILL BE INCURRED. This AZ Petrified Wood small log weighs 91 lbs. It stands 13 1/2 inches tall and measures 12 x 7 1/2 inches across. First photo shown wet. SHIPPING CHARGES WILL BE INCURRED. This AZ Petrified Wood small log weighs 92 lbs. It stands 12 inches tall and measures 15 x 8 inches across. First photo shown wet. SHIPPING CHARGES WILL BE INCURRED. This AZ Petrified Wood small log weighs 32 lbs. It stands 7 1/2 inches tall and measures 12 x 7 inches across. First photo shown wet. SHIPPING CHARGES WILL BE INCURRED. 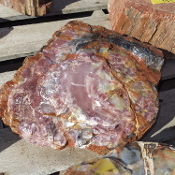 This AZ Petrified Wood small log weighs 42 lbs. It stands 8 1/2 inches tall and measures 9 1/2 x 8 1/2 inches across. First photo shown wet. SHIPPING CHARGES WILL BE INCURRED. 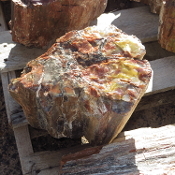 This AZ Petrified Wood small log weighs 41 lbs. It stands 6 1/2 inches tall and measures 11 1/2 x 8 1/2 inches across. First photo shown wet. SHIPPING CHARGES WILL BE INCURRED. This AZ Petrified Wood small log weighs 35 lbs. It stands 6 1/2 inches tall and measures 11 x 8 1/2 inches across. First photo shown wet. SHIPPING CHARGES WILL BE INCURRED. 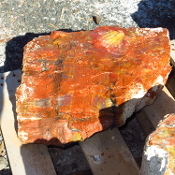 This AZ Petrified Wood small log weighs 28 lbs. It stands 6 inches tall and measures 12 x 6 1/2 inches across. First photo shown wet. SHIPPING CHARGES WILL BE INCURRED. This AZ Petrified Wood small log weighs 68 lbs. It stands 7 1/2 inches tall and measures 17 x 9 inches across. First photo shown wet. SHIPPING CHARGES WILL BE INCURRED. This AZ Petrified Wood small log weighs 54 lbs. It stands 8 inches tall and measures 13 x 6 inches across. First photo shown wet. SHIPPING CHARGES WILL BE INCURRED. This AZ Petrified Wood small log weighs 43 lbs. It stands 8 inches tall and measures 9 1/2 x 8 inches across. First photo shown wet. SHIPPING CHARGES WILL BE INCURRED. This AZ Petrified Wood small log weighs 54 lbs. It stands 8 1/2 inches tall and measures 13 1/2 x 8 1/2 inches across. First photo shown wet. SHIPPING CHARGES WILL BE INCURRED. This AZ Petrified Wood small log weighs 37 lbs. It stands 4 inches tall and measures 15 x 11 inches across. First photo shown wet. SHIPPING CHARGES WILL BE INCURRED. This AZ Petrified Wood small log weighs 39 lbs. It stands 5 inches tall and measures 15 x 11 1/2 inches across. First photo shown wet. SHIPPING CHARGES WILL BE INCURRED. This AZ Petrified Wood small log weighs 57 lbs. It stands 6 inches tall and measures 13 x 12 inches across. First photo shown wet. SHIPPING CHARGES WILL BE INCURRED. 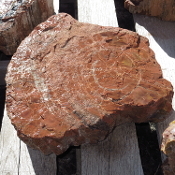 This AZ Petrified Wood small log weighs 34 lbs. It stands 10 inches tall and measures 9 1/2 x 4 inches across. First photo shown wet. SHIPPING CHARGES WILL BE INCURRED. This AZ Petrified Wood small log weighs 73 lbs. It stands 9 inches tall and measures 11 x 7 inches across. First photo shown wet. SHIPPING CHARGES WILL BE INCURRED. 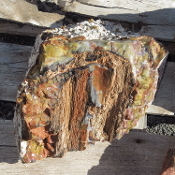 This AZ Petrified Wood small log weighs 45 lbs. It stands 9 inches tall and measures 13 x 8 inches across. First photo shown wet. SHIPPING CHARGES WILL BE INCURRED. This AZ Petrified Wood small log weighs 64 lbs. It stands 9 inches tall and measures 13 1/2 x 9 1/2 inches across. First photo shown wet. SHIPPING CHARGES WILL BE INCURRED. 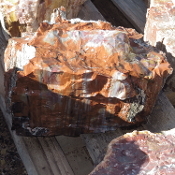 This AZ Petrified Wood small log weighs 41 lbs. It stands 7 inches tall and measures 11 x 10 inches across. First photo shown wet. SHIPPING CHARGES WILL BE INCURRED. This AZ Petrified Wood small log weighs 47 lbs. It stands 4 1/2 inches tall and measures 18 1/2 x 10 1/2 inches across. First photo shown wet. SHIPPING CHARGES WILL BE INCURRED. 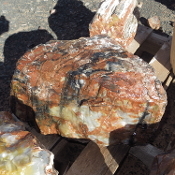 This AZ Petrified Wood small log weighs 31 lbs. It stands 6 1/2 inches tall and measures 10 1/2 x 7 inches across. First photo shown wet. SHIPPING CHARGES WILL BE INCURRED. 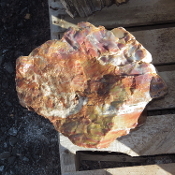 This AZ Petrified Wood small log weighs 28 lbs. It stands 5 inches tall and measures 12 x 9 inches across. First photo shown wet. SHIPPING CHARGES WILL BE INCURRED. 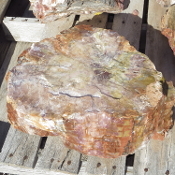 This AZ Petrified Wood small log weighs 34 lbs. It stands 7 inches tall and measures 12 x 6 1/2 inches across. First photo shown wet. SHIPPING CHARGES WILL BE INCURRED. 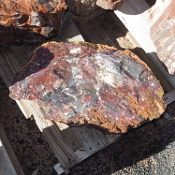 This AZ Petrified Wood small log weighs 29 lbs. It stands 5 inches tall and measures 10 x 8 inches across. First photo shown wet. SHIPPING CHARGES WILL BE INCURRED. 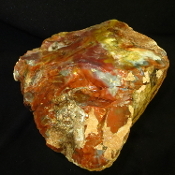 This AZ Petrified Wood small log weighs 31 lbs. It stands 6 inches tall and measures 11 1/2 x 6 inches across. First photo shown wet. SHIPPING CHARGES WILL BE INCURRED. This AZ Petrified Wood small log weighs 35 lbs. It stands 8 inches tall and measures 10 x 6 1/2 inches across. First photo shown wet. SHIPPING CHARGES WILL BE INCURRED. This AZ Petrified Wood small log weighs 51 lbs. It stands 7 inches tall and measures 12 x 7 inches across. First photo shown wet. SHIPPING CHARGES WILL BE INCURRED. This AZ Petrified Wood small log weighs 57 lbs. It stands 9 inches tall and measures 11 x 6 inches across. First photo shown wet. SHIPPING CHARGES WILL BE INCURRED. This AZ Petrified Wood small log weighs 35 lbs. It stands 13 inches long and measures 7 x 5 inches across. First photo shown wet. SHIPPING CHARGES WILL BE INCURRED. This AZ Petrified Wood small log weighs 36 lbs. It stands 8 1/2 inches tall and measures 7 1/2 x 6 1/2 inches across. First photo shown wet. SHIPPING CHARGES WILL BE INCURRED. This AZ Petrified Wood small log weighs 52 lbs. It stands 6 inches tall and measures 15 1/2 x 9 inches across. First photo shown wet. SHIPPING CHARGES WILL BE INCURRED. This AZ Petrified Wood small log weighs 78 lbs. It stands 6 inches tall and measures 16 x 12 1/2 inches across. First photo shown wet. SHIPPING CHARGES WILL BE INCURRED. This AZ Petrified Wood small log weighs 48 lbs. It stands 6 1/2 inches tall and measures 13 1/2 x 11 3/4 inches across. First photo shown wet. SHIPPING CHARGES WILL BE INCURRED. This AZ Petrified Wood small log weighs 35 lbs. It stands 11 inches tall and measures 11 x 7 inches across. First photo shown wet. SHIPPING CHARGES WILL BE INCURRED. This AZ Petrified Wood small log weighs 72 lbs. It stands 6 1/2 inches tall and measures 13 1/2 x 11 3/4 inches across. First photo shown wet. SHIPPING CHARGES WILL BE INCURRED. 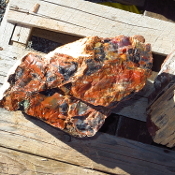 This AZ Petrified Wood small log weighs 50 lbs. It stands 10 inches tall and measures 10 1/2 x 7 1/2 inches across. First photo shown wet. SHIPPING CHARGES WILL BE INCURRED. This AZ Petrified Wood small log weighs 43 lbs. It stands 9 inches tall and measures 8 1/2 x 6 inches across. First photo shown wet. SHIPPING CHARGES WILL BE INCURRED. This AZ Petrified Wood small log weighs 44 lbs. It stands 11 1/2 inches tall and measures 12 x 6 inches across. First photo shown wet. SHIPPING CHARGES WILL BE INCURRED. 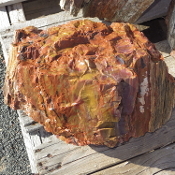 This AZ Petrified Wood small log weighs 29 lbs. It stands 6 1/2 inches tall and measures 12 x 6 1/2 inches across. First photo shown wet. SHIPPING CHARGES WILL BE INCURRED. 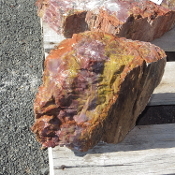 This AZ Petrified Wood small log weighs 42 lbs. It stands 8 1/2 inches tall and measures 10 x 10 inches across. First photo shown wet. SHIPPING CHARGES WILL BE INCURRED.